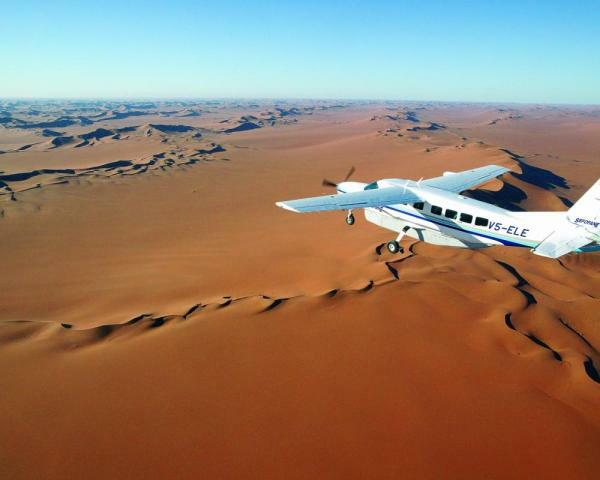 Experience Namibia's diverse landscape, wildlife and cultural heritage from a birds eye view on this exciting 7-day Fly-In Safari. Visit the great sand sea of the Namib Desert and Sossusvlei, fly over shipwrecks along the Skeleton Coast, and search for wildlife in the famed Etosha National Park. Return each evening to the comforts of Camp Kipwe, Kuala Desert Lodge and Okaukuejo Resort. This fly safari is short on time but big on adventure! This morning you will fly over the central highlands of Namibia before descending into the Geluk airstrip in the Kulala Wilderness Reserve. 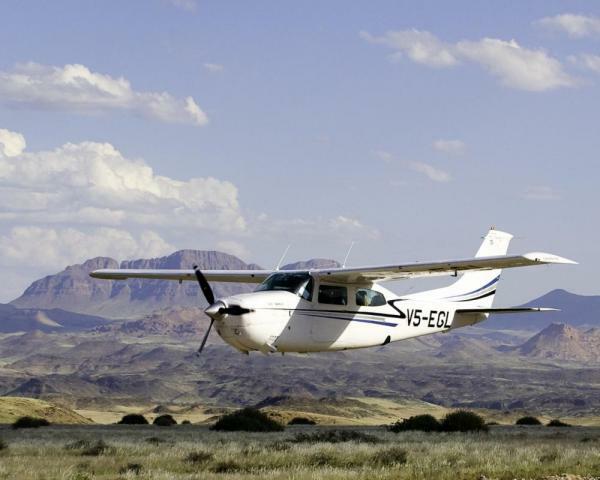 Your guide will meet you at the airstrip and accompany you to your comfortable lodge in the Namib Desert. 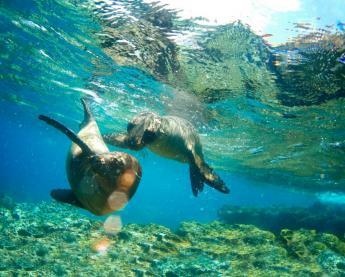 Settle in before enjoying one of the many excursions offered at Kulala Desert Lodge. Return for dinner and settle in after an exhilarating first day in Namibia. 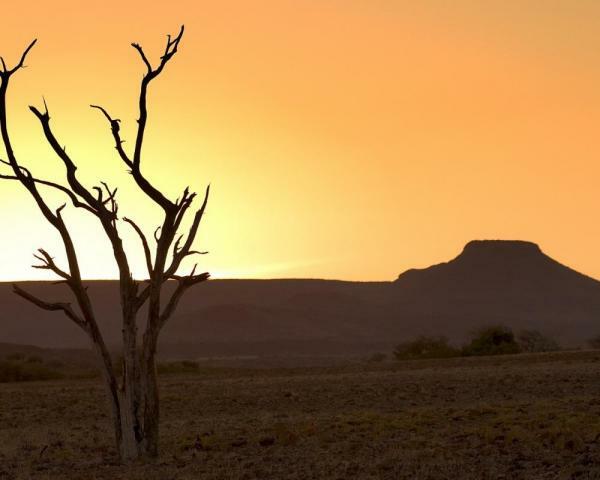 Rise early this morning for a magical excursion into the Namib Naukluft National Park for sunrise. Watch as the sun's rays capture the dunes and the soft lighting spreads over the red sand dunes, accentuating their towering shapes and curves. 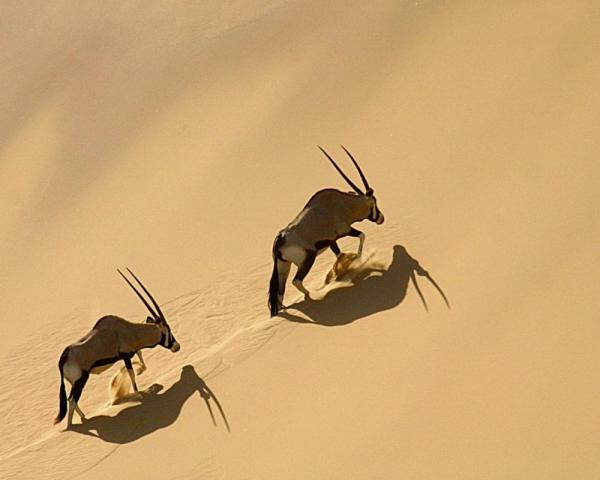 This part of Namibia boasts some of the highest free-standing sand dunes in the world, and the possibilities for exploration are endless. 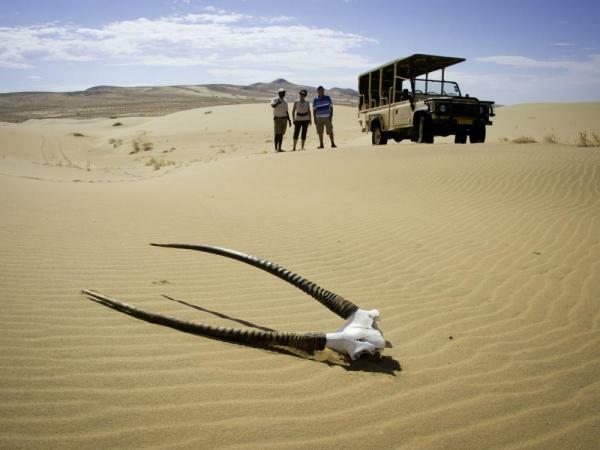 Your guide will give you insight into the formation of the Namib Desert, including the myriad of creatures and plants that have adapted to survive in this harsh environment. Return to the lodge for a late lunch, spending the rest of the afternoon either relaxing at the lodge or exploring the Sesriem Canyon. Enjoy one final breakfast in the desert before returning to the airstrip, where you are whisked north to the heart of Damaraland. 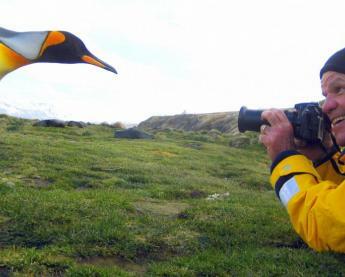 Keep your eyes peeled as you fly over the coast, searching for the remains of shipwrecks, seal colonies and deserted mining camps. Upon arrival in Damaraland you will be met by your guide and transferred to Camp Kipwe for lunch. The remainder of the afternoon is spent visiting the rock engravings and World Heritage Site at Twyfelfontein. Return to camp in time to catch the striking sunset before dinner. Set out early for an exciting 4x4 excursion along the ephemeral Aba Huab River Valley, exploring this remarkable region in search of the elusive desert adapted elephants and rhino. Damarland is one of Namibia's most scenic regions, and this untamed, ruggedly beautiful landscape features open plains, massive granite koppies, deep gorges and an endless skyline. Return to camp for lunch and a well-deserved afternoon siesta. If energy permits, you can join your guide on an afternoon walk around camp before dinner. Another early departure this morning as you set out north, traveling deeper into the heart of Damaraland as you make your way to Etosha National Park. 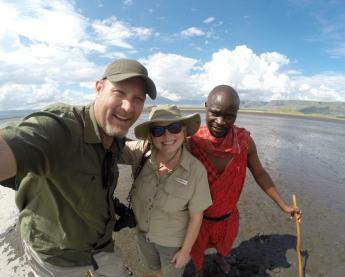 En route you will visit an extremely remote Himba Village, where your guides presence and contacts within the local community ensure you are welcomed as a "friend of a friend". 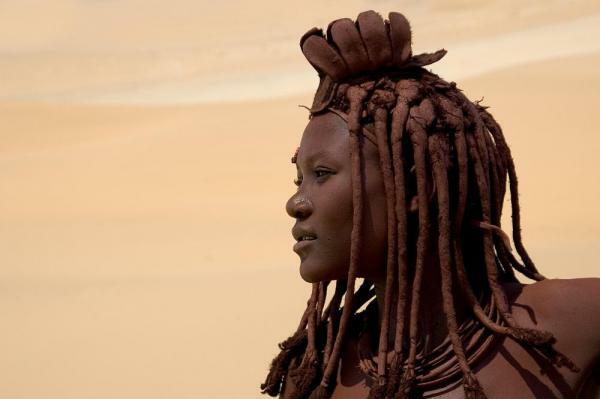 The Himba remain one of Namibia's last true traditional peoples, and your exchange here is sure to be fascinating and memorable. Your journey continues north, and you will arrive at Okaukuejo Resort near Etosha's southern gate after enjoying a picnic lunch in a scenic location. Settle in for a restful evening after a full day of exploration. 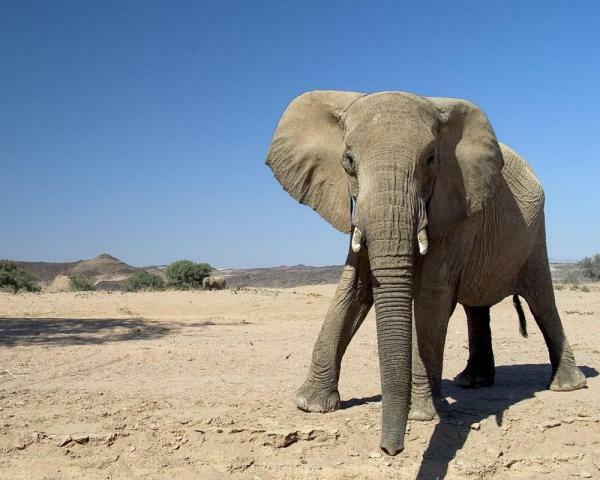 Set out today for an exciting full-day game drive in Namibia's famed Etosha National Park, stopping for a picnic lunch at a particularly busy watering hole. Etosha is home to various wildlife species, including lion, leopard, elephant, rhino, giraffe, wildebeest, cheetah, hyena and zebra. Alternatively, you can embark on a morning and evening game drive, returning to the camp for lunch and a quick rest. Either way, return to camp for your last evening in this remarkable country. Depart Etosha National Park after breakfast this morning, making your way south toward the Okonjima Day Center and the AfriCat Foundation. 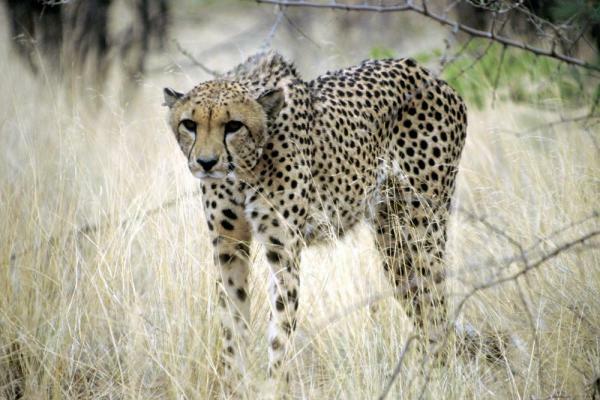 This foundation is one of the world's premier large-cat conservation efforts, and you will have the opportunity to explore the center while on a game drive and guided tour. Upon conclusion of your time at AfriCat, continue south toward Windhoek to spend your final evening at an accommodation of your choice.